Posted in Misc and tagged sequel, Star Trek at 12:55 pm on November 3, 2015 by Broadsheet. Everything since DS9 was average at best, Enterprise worse. Hope this is better. But I’m getting older. There lies the main problem. DS9 ….Home & Away in space. That’s what I called that one. I hate this with a passion, I know I’m sad. But the last films were really good, so maybe now I might get the whole trekie thing if this series is good. Into Darkness was one of the biggest non-Transformers pieces of dreck that I’ve seen in recent years. And I give Star Trek 5 a chance. Hoping it’s more DS9 than end-of-episode-reset-button stuff like Voyager. DS9 broadened the scope of the franchise, moved it on from TNG, but then VOY and ENT dragged it back. Here’s hoping the new one picks up where it left off. And please, PLEASE set it in the prime universe – we don’t need TNG rehashed in the poxy Abramsverse. 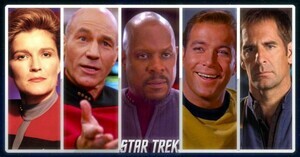 The promo image obviously starting with the best captain in the middle, then moving outwards in declining quality. You fancied Sisko. It’s the only way DS9 could be considered good….. surely…. Do you even Dominion War? Your pah is weak, my child. Have a raktajino and a jumja stick and come back to me. In The Pale Moonlight and Rapture are two of my fave episodes of all Trek. DS9 gave a depth and reality to the future in ways none of the others did. TOS and TNG progressed to DS9 – VOY and ENT were Berman taking it back to the comfort zone. Feck, outnerded before I got a look in. Odo was a great character. *lies down Picard photo on desk. I liked Enterprise and the whole story arc with the Borg in Voyager was brilliant. In saying that I did have a soft spot for Quantum Leap and a warm spot for Jolene Blalock. They absolutely neutered the Borg. Turned the collective into basically one vindictive woman who was somehow on a par with and held a petty grudge against Janeway. They removed all the dread and villainy from TNG and First Contact and made them a quirky villain of the week, constantly out-thought and out-manoevered by a lone starship that after seven years in the wilderness, got home in BETTER NICK than when it left! Awful series, completely wasted opportunity. They ignored their whole Maquis-v-Starfleet premise after the first few episodes, after season 2 it didn’t really matter that they were stranded either. Anything really bad that happened was reset by time travel or deus ex machina at a time when DS9 was becoming the first Trek to show consequences to actions. Hmmmmm… T’Pol and 7 of 9…. Both can’t hold a candle to Jadzia Dax and Kira Nerys. Now they were proper female characters. Let’s hope the captain is bald. Everyone knows DS9 didn’t get any good until Sisko shaved his nut. anyone else annoyed by the way they have the captains in order in that picture?